I’m ARNOLD J. PADILLA, a Filipino activist, writer, and researcher. The opinions and analyses here are my own and do not represent those of the organization/s that I’m currently affiliated with. Great to be a writer-researcher-journalist because you have the facility to communicate. Much more so when one is an activist [political, environmental, other fields] because you can easily get your message across in writing of various forms like news [the fastest vehicle], feature items, or via poetry, short story, etc.. I am Reggie from UP Manila. Can I interview you for my thesis? It may be via email if that’s the most convenient for you. I can send you the questionnaires, sir. It is about the political influence of businessmen Henry Sy and John Gokongwei. Hi Arnold! This is Lyn. 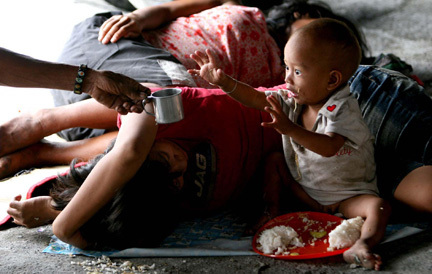 I really like your picture on this: https://arnoldpadilla.files.wordpress.com/2011/06/poverty-talakayanatkalusugan-com.jpg. I hope it would be okay for me to use the picture and I will cite it accordingly as well in a video that I am doing for a travel grant award competition. I can let you see the video if you want to see how it was used and how you were cited. Hi lyn. The photo isn’t mine. I got it from blog site called talakayan at kalusugan. I put it in the photo caption in my article (https://arnoldpadilla.wordpress.com/2011/06/30/aquino’s-“pilipinas-natin”-pilipinas-nino/). I’m a student doing a research about the ERC and performance of electrical utilities. I saw your posts and I think they’re great. I have a few questions in mind about what you’ve discussed and some inquiries about the field. Is it possible to contact you privately? Wow, I see someone actually read the chapter I wrote on prepaid electricity! It has been an insidious tool here in South Africa to divert attention away from collective struggle (for resources and services) towards individual struggle (to pay for “electricity units”). Good luck with your struggle in the Philippines!